thisUser: Why is Blogger Hiding Things? Why is Blogger Hiding Things? 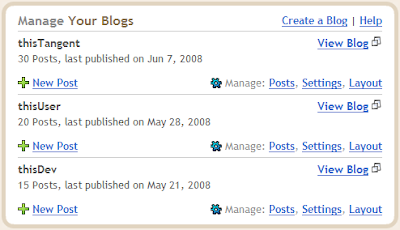 Blogger just introduced a new Dashboard in Blogger in Draft. Here's the main part of it. I went to the Blogger in Draft blog to post a complaint but saw that plenty of people had beaten me to it. And what are we all complaining about? Bloggers with 2 blogs or less -- these people won't even notice the change. Bloggers with 3 to 5 blogs -- these people probably rotate around their blogs, for a variety of reasons. For none of these people, can I imagine that "most recent 2 blogs" is a good set. For myself, I'm more likely to want the blog I posted on least recently to show up, as a reminder that I've been remiss in posting. Bloggers with 6 or more blogs -- these people are power users and probably have a variety of usage patterns, so there may be no way to satisfy all of these people (but we should try). They also removed the total number of posts. I don't get that one either. Sure, it's not important to some people, but there is no other easy way to get that information. I was initially surprised that, when I clicked Display all 3 blogs, they didn't remember that. In retrospect, however, that's correct. If they're hiding things and the things they're hiding changes over time, then I suppose they shouldn't remember that you hid anything. But that's a big IF and I think it's a flawed assumption. Well, there's the obvious one, proposed by a number of people commenting on the blog post about the new feature -- add an option to always show all the blogs. But, I've said before that every option we add to a user interface is a decision that we were unable to make during development. So, can we just do something that is so obviously right that everybody will just think it is the right thing? Sure we can. First, we need to know what the objective is. I think the goal was to make cleaner, simpler, and smaller for users who have blogs that they're not posting to. I think they forgot easier to use, which should always be a goal because, if we forget that, it is way, way too easy to add features that actually make our products harder to use. And hiding things should never be a goal -- it should only be a way to accomplish a benefit, which it fails to do here. Keep the new look -- it's fine. Show all the blogs, in most-recent-to-least-recent order. Collapse all blogs that have not been "touched" in the last month. Provide a expand/collapse icon or button to allow the expansion of any blogs that are collapsed. The collapse icon is probably not necessary, but having it there for symmetry is a good idea. And what's the definition of "touched"? Any blog that has been modified to in the last month in any way (new post, editing of an old post, creation of a draft post, deletion of a post, etc.) or has been expanded in the dashboard is considered to be touched. The result is that active blogs are always available and dormant blogs are a click away. But even that click is improved because the click is on the exact blog the user wants and they know where they controls will be after the click, rather than having to click the expand button and then look through what's appeared. A change like this would not even be noticed by most users -- it would just feel right. Users with multiple, active blogs will see no change. Users with dormant blogs will have them taking up less space and won't mind that. Even power bloggers with lots of blogs, will get the right behavior for both their active and dormant blogs. It's a win all around. Focus on the real goals of your UI change. Make sure that "ease of use" is always (or almost always) part of your goals. Aim for a change that just feels right -- that people will just say "that's the way it should have been in the first place"